A dead juvenile humpback whale has washed up at Snout Point, Fraser Island. BOATIES are being warned about the likely increased presence of sharks in waters off Fraser Island. This is after a dead humpback whale washed ashore at Snout Point on the island's south-western side. A Department of Environment spokeswoman said due to the remote location of the carcass, it would be left on site in the tidal area to allow the "natural process". She warned all boaties, commercial fishers and tourism operators to stay well away from dead whales "due to the dangers associated with sharks". 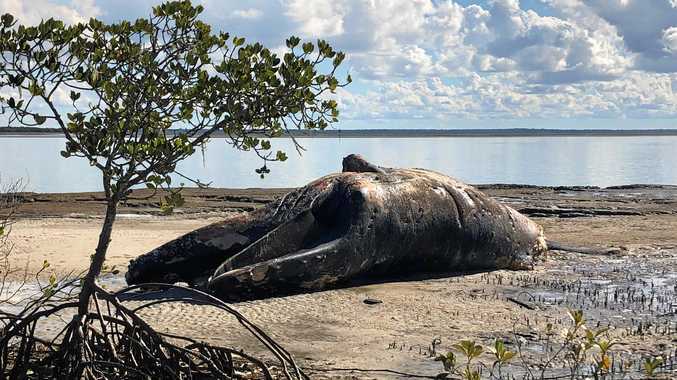 The spokeswoman said it was not possible to determine the cause of death due to the age of the carcass, however the whale was likely to have died weeks ago based on the level of decomposition. Stranded whales should be reported immediately to the RSPCA on 1300264625 (1300 ANIMAL).